Crab cakes. They seem simple. 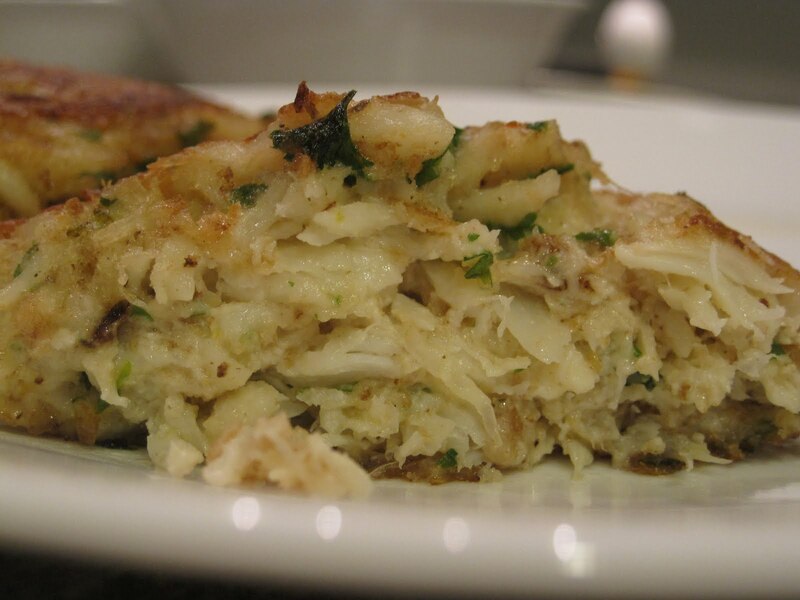 But a good crab cake is quite difficult to make. They can be too dry. They can be too moist. They can fall apart. They can have too much filler and not enough crab. They can lack flavor. They can have too much flavor. By too much flavor, I mean that sometimes, they have lots of chopped ingredients, some combination of onions, celery, peppers. I've never really liked crab cakes with chopped veggies - I think it takes away from the crab-i-ness of a crab cake. The crab should be the flavor that shines through. 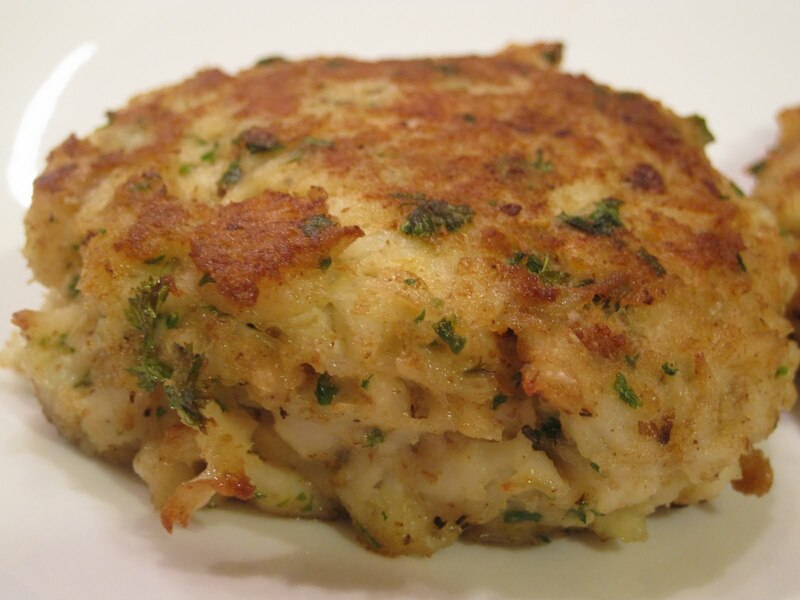 I am always suspicious of restaurants that claim to serve 'our famous crab cake.' Invariably, when I order crab cakes at a restaurant, I end up disappointed and wishing I'd ordered something else (the lone exception being the crab cake appetizer at The Charleston Grill). I was very excited when I read the Crab Cakes, The Right Way post at Pittsburgh Hot Plate. 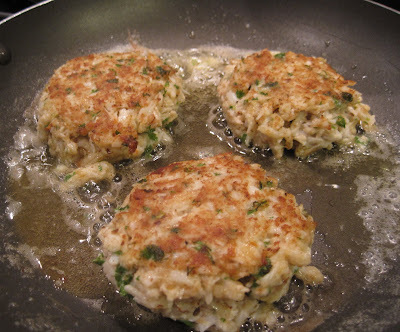 Someone with a crab cake recipe that didn't call for peppers, onions, other fillers and flavors! 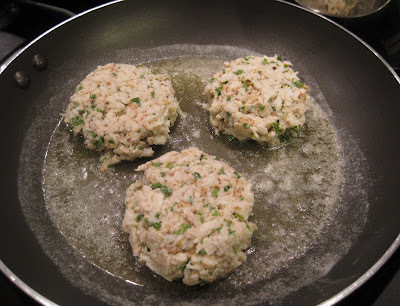 Since we just bought some canned crab at Giant Eagle's Seafood Stock Up Day, we decided to try making crab cakes. My first time ever making crab cakes! We needed bread crumbs for both the crab cakes & a chicken-rice bake that we were planning to make, so we took the last 8 slices of white bread from the freezer, toasted them in the toaster, cooled them on a cooling rack, and then pulsed them in the food processor. Then we gathered our crab cake ingredients: We cut the recipe in 1/3 since we were using just 1 can of crab. It's so simple - just measure everything out and dump it into a bowl, gently mix, and then form into balls. We used an ice cream scoop to get uniform crab scoops. 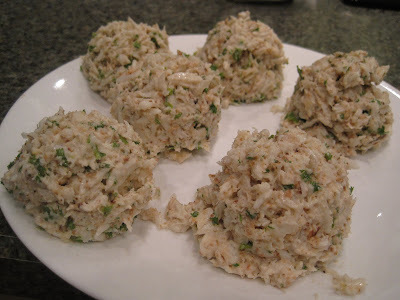 Mmm these looked so good and I kept sneaking tiny tastes of the crab bits that flaked off until SP reminded me that I have a sensitive stomach and that the crab mixture contained raw egg. Oops. Time to fry them. We fried 3 at a time, not one at a time, in a bit of olive oil & butter. Soon, the smell of sizzling crab wafted through the house. We ever so carefully & gently flipped them over: Then they baked in the oven at 350 for about 10 minutes. Finally, they were ready to eat! We each ate 1.5 crab cakes. Here's a photo of the inside of the one we cut in half: A thing of beauty -- just crab and parsley. No pepper chunks, no onion chunks. We did not serve them with tartar sauce or lemon wedges. Along with the crab cakes, we ate the ground cherries. We peeled off the husks, washed them, and ate them like blueberries. They do have a faint fruit taste, though it's hard to pin down if it's strawberry or pineapple or something else. We also had some of the Fully Loaded Cheesy Potato Soup and a mixture of wilted spinach & kale with red pepper alongside our crab cakes. A delicious meal. For crab cake recipe please see Pittsburgh Hot Plate's post 'Crab Cakes, The Right Way' here. I totally agree - no Bay or peppers please - just crab! These look delicious! Double agree! My family roots are in Maryland where they don't mess around with crab cakes. 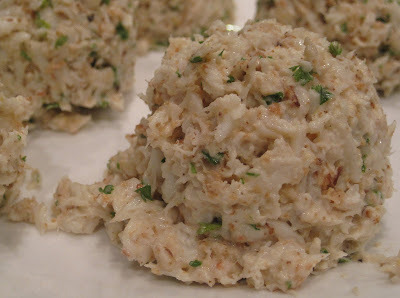 They should fall apart with heaping chunks of crab, not some pureed mush cake :) Can't wait to try these! Old Bay seasoning. 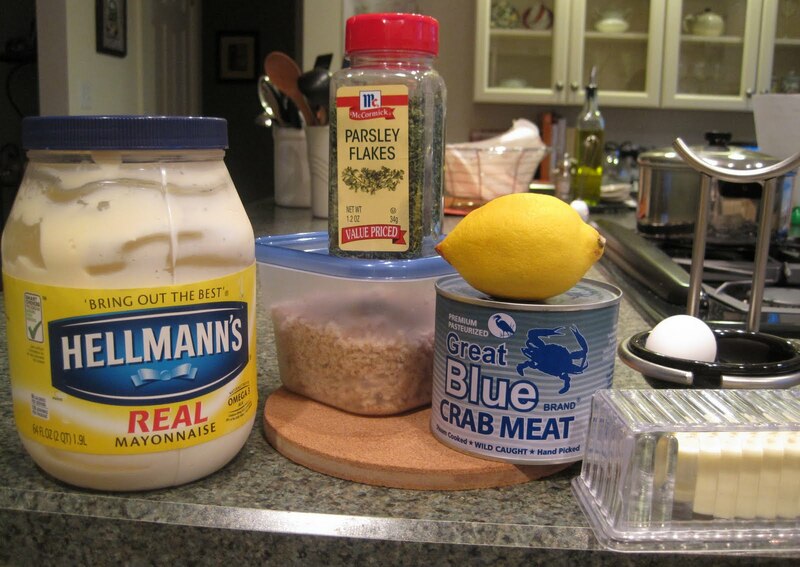 Best crab cake recipe on the side of the can. True Maryland crab cakes. Make them with fresh backfin and you'll be in heaven! Although yours looked very delicious too!